The 26th of September, 2015, marks the return of Batman Day, a celebration for the world's most popular super hero. To honor this occasion, us fans will receive a free copy of BATMAN ENDGAME: SPECIAL EDITION #1, with an 8-page preview of the upcoming, BATMAN AND ROBIN ETERNAL, at our local comic shops, libraries, and bookstores. 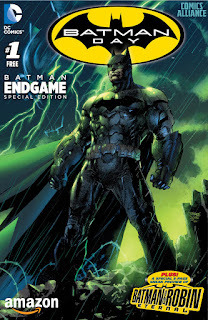 Select physical and online retailers will be carrying free, exclusive variant covers for BATMAN ENDGAME: SPECIAL EDITION #1, allowing fans to create a set. WHAT: Back by popular demand, 'Batman Day' honors one of the most iconic Super Heroes of all time. This celebration will feature all things Batman from comic books to video games and more, inviting fans everywhere to partake in numerous festivities at thousands of comic book shops, bookstores, schools, libraries and other retail partners. WHO: Signings and meet-and-greets with top Batman talent including an all-star line-up at Baltimore Comic-Con with Scott Snyder, Greg Pak, Jimmy Palmiotti, Amanda Conner, Peter Tomasi, Cully Hammer, and Klaus Janson. Additional Batman day signings include acclaimed artist and DC Entertainment Co-Publisher Jim Lee (Los Angeles), Greg Capullo (Guilderland, NY), Tom King (Baltimore), Paul Dini (Los Angeles), Tim Seeley (Chicago), Dan Jurgens (St. Paul), Brenden Fletcher (Toronto, ON), Sean Murphy (Brooklyn) Len Wein (Los Angeles), Chris Burnham (Burbank), Ray Fawkes (Toronto, ON), Pat Gleason (St. Paul), Brian Buccellato (Los Angeles), Kyle Higgins (Los Angeles), Matt Manning (Asheville, NC), Daniel Wallace (Eden Prarie, MN), with many more to be announced. WHERE: Among the libraries, the bookstores, and the comic shops who will participate in this event, there will also be a number of retailers such as Barnes & Noble, Best Buy, Books a Million, FYE, Gamestop, Hastings, Hot Topic, Spencers, Apple iTunes, Amazon , ComiXology, Google Play and Nook. 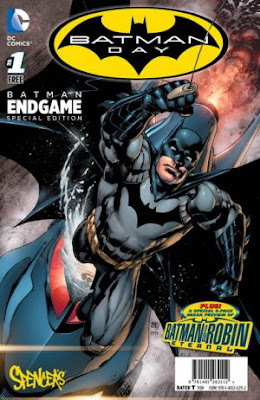 Many of these retailers will also offer fun promotional giveaways and special deals on Batman products. For more information please visit DCComics.com/BatmanDay for a map of participating locations.